This statistic shows the number of medium and heavy commercial vehicles that were registered in selected countries across Europe in 2017. In France, over 51,300 heavy commercial vehicles were registered in 2017. At almost 91,760, the majority of heavy commercial vehicle registrations within Europe were issued by Germany. Not only is the European powerhouse king of the European heavy truck market in terms of registrations, but it is also home to key players in the heavy commercial vehicle manufacturing market, including Daimler’s truck segment, as well as Volkswagen’s MAN and Scania. In the fiscal year of 2016, Daimler Trucks contributed about 35.7 billion to the manufacturer's total revenue, while Mercedes-Benz Vans contributed about 13.2 billion. 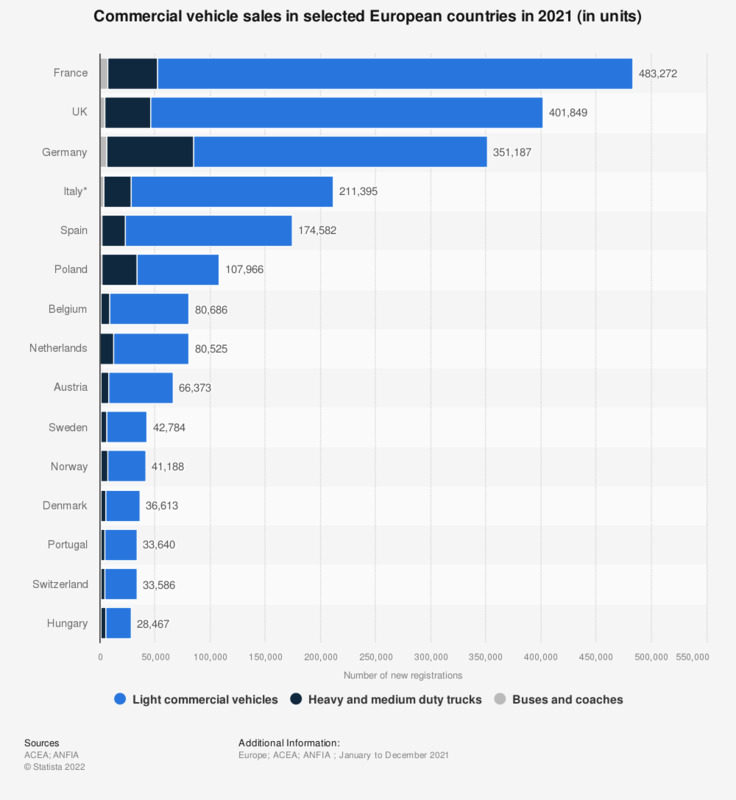 This statistic includes figures for light and medium commercial vehicles up to 3.5 metric tons, heavy commercial vehicles over 3.5 metric tons and buses or coaches over 3.5 metric tons. Everything On "Automotive industry in the Netherlands" in One Document: Edited and Divided into Handy Chapters. Including Detailed References.